For more detailed information, see Rain Sensors FAQ. In most installations, a rain sensor acts as a switch; as moisture absorbing disks expand, they activate a switch that interrupts the circuit from the controller to the solenoid valves. Once the rain sensor has dried out, the switch deactivates to allow for normal operation. The Rachio 2nd Generation Smart Sprinkler Controller is compatible with any wired or wireless normally closed (NC) rain sensor, which activates after rainfall (when the moisture-absorbing disks expand). The Rachio 3 Smart Sprinkler Controller and the Rachio Generation 1 Smart Sprinkler Controller are also compatible with any wired or wireless normally closed (NC) rain sensor. 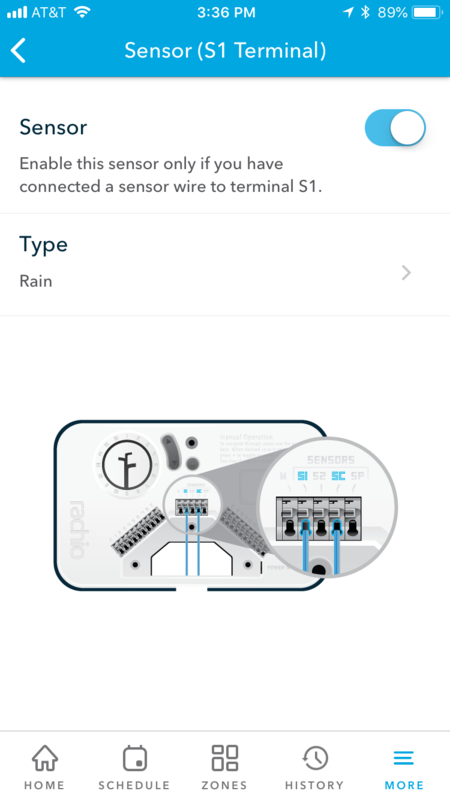 For Rachio 3 sensor wiring instructions, go here. For Generation 1 sensor wiring instructions, go here. 3) Locate your controller's sensor terminals (SC & S1,S2) and attach the Rain Sensor control wires directly to these terminals (in either order) -- see diagrams. 4) Reconnect power to the Rachio controller. Avoid routing the wire over any sharp edges where damage to the wire insulation may occur. For best results, hide the wire as much as possible by tucking it under shingles and/or moldings. Seal any holes made by passing the wire through structure walls. Either terminal "S1" or "S2" can additionally be used for a flow sensor. 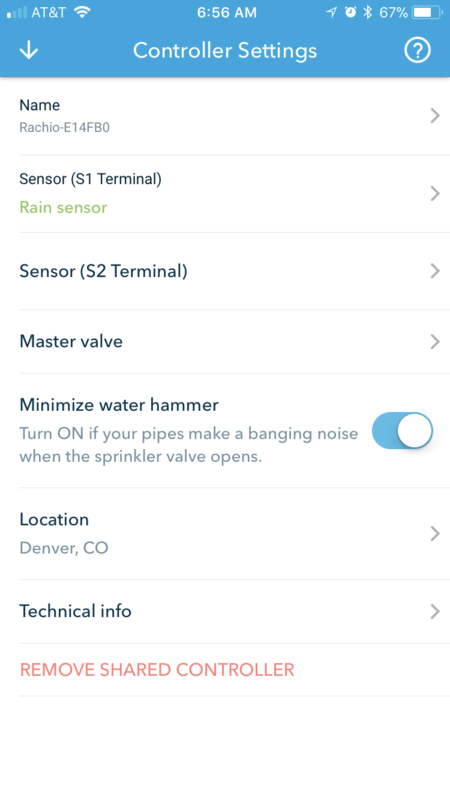 Configuration in the app allows you to assign a rain sensor or flow sensor to either terminal. 1) From the Rachio app, select the "More" tab and then select "Accessories." 2) Next, select which terminal or terminals you would like to activate - "Sensor (Terminal 1)" or "Sensor (Terminal 2)". 3) Enable the sensor by toggling it on, then select "Rain Sensor".